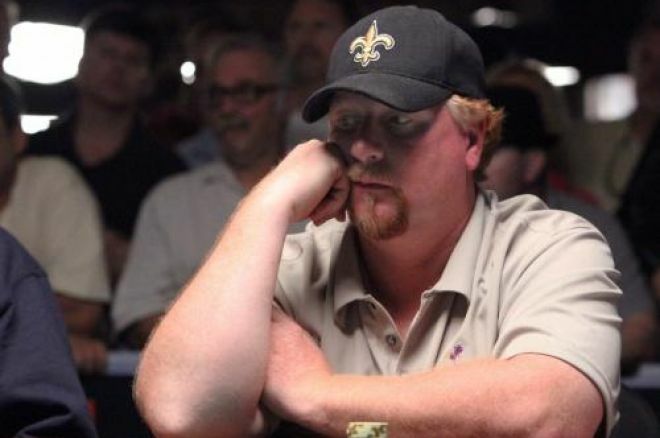 This year's World Series of Poker Main Event final table has its share of colorful personalities but perhaps the most interesting player of the group is chip leader Darvin Moon, a 45-year-old logger from Oakland, Md. Despite lacking the prowess of some of his tablemates such as Phil Ivey and Jeff Shulman, Moon has quietly positioned himself for the win of a lifetime after amassing a sizable stack that is roughly a third of the chips in play. Sitting with 58,930,000 chips, Moon may not have the experience of his tablemates, but he definitely has the ammunition to make life difficult for them. Considering that Moon got into the WSOP Main Event by winning a $130 buy-in tournament, and that he has already eclipsed his buy-in by over a million, he has nothing to lose, which makes him one of the most dangerous players at the table. Moon played a solid game before the final table, riding a wave of good luck with which he eliminated a number of top pros along the way. One example of Moon's solid play is a hand that saw the elimination of high-stakes maven David Benyamine after a shrewd slow play. In the hand, Moon called a small raise from Benyamine preflop. The board came , Moon made a small bet, Benyamine raised, Moon reraised, Benyamine four-bet, and Moon made the call. The came on the turn and Moon bet enough to put Benyamine all-in. Benyamine snap called with pocket aces to find Moon holding the winning hand with his flopped set of threes. Another example of Moon's lucky streak was when he eliminated Billy Kopp in one of the biggest hands of the tournament. Moon called a raise from Kopp who was in the small blind. The board came . Moon checked and Kopp made it 750,000 to go. Moon called. The turn brought a deuce and Moon once again checked. Kopp bet 1.2 million. Moon then raised to six million and Kopp shoved all-in for the rest of his stack. Moon snap-called holding for a queen-high flush, defeating Kopp's . If we have learned one thing over recent years when it comes to the WSOP Main Event, it is that amateur players have a good chance of finishing first. The thing that makes players like Moon such a challenge for opponents is that they don't necessarily play the way other pros do. Many top players including the aforementioned Kopp found it almost impossible to get a read on Moon because he made plays that would go against the traditional theory most pros go by. Add the fact that Moon made himself a tough nut to crack by mixing in plenty of good moves when he was lucky enough to find hands. Despite his luck and personal style of play, Moon is one of the less-experienced players at the table and thus has his work cut out for him despite being the big stack at the table. Look for Ivey, Shulman and others to try to take a chunk of Moon's stack early with aggressive play. Moon has a big target on his back and the pros are licking their lips at the thought of getting in a big hand with someone less-experienced. In addition to having to battle noted pros, Moon will also have to withstand the assault of other short stacks or he will find himself in the middle of the pack where he will be much less of a threat. If Moon wants to win, he'll need to avoid tangling with the pros and he'll have to win the majority of scraps he gets involved in. The PokerNews Live Reporting Team will be in Las Vegas in November bringing you the play-by-play of the WSOP Final Table and as always, follow us on Twitter for up-to-the-minute news.